United States citizens welcome. Real-money sports, poker & casino. Works on any phone: Android, Blackberry, iPhone or Windows Phone. Internet and mobile wagers receive a daily rebate of up to 7%. 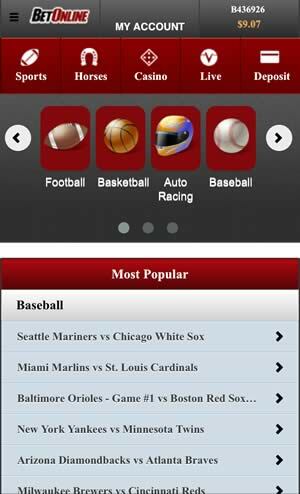 Get free handicapping tips and daily match-ups on iOS or Android. 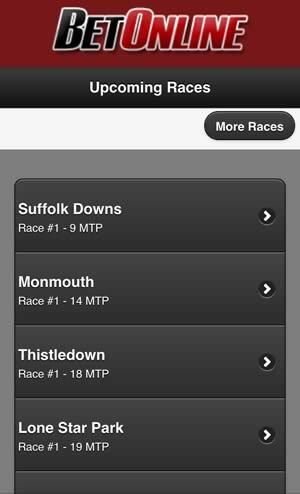 App covers all US racetracks, including Churchill Downs & Pimlico. 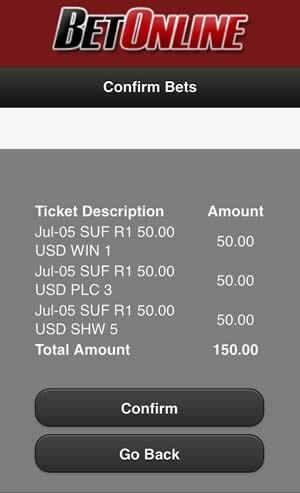 Get a $50 free play bet on your first mobile wager from iOS or Droid. BetOnline are quickly becoming the go-to bookmaker for US based bettors. Over the years they have continued to serve up one of the most in-depth and reliable bookmakers in the world. Whilst many of you will be fully aware that the US have had their fair share of issues with regards to regulating banking, a lot of that is now in the past and there are reputable companies out there providing a safe and secure way for US players to bet. ﻿It's always refreshing to see companies such as BetOnline work hard to promote sports outside of the big four in the US. Everyone knows how popular these sports are and it's very easy for bookmakers to just have these as their main betting markets and leaving it at that. The inclusion of horse racing has been a refreshing change from the majority of US bookmakers for BetOnline and, as you will find out later in the review, they have worked as hard as anyone to promote the sport at a level most bookmakers would be proud of. 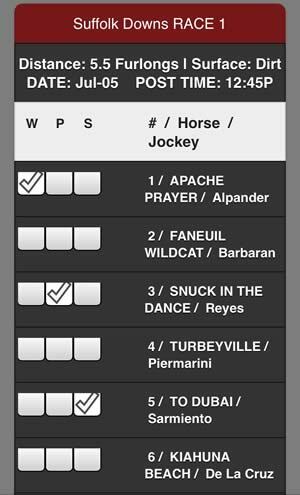 We've spoken briefly about how impressed we were to simply see BetOnline include horse racing in their portfolio and it came as quite a surprise to see yet another US based bookmaker provide the sport its own betting section on the app. This just goes to show how popular horse racing is in the US, but what's more pleasing about it is that BetOnline have realised it and acted. Other sports such as your baseball's, American football's and basketballs don’t even get this sort of treatment on the app! To access the horse racing section you will need to click on the 'Horses' button in the top navigation bar within the app. You may notice that this is the only way in which you can access these betting markets as, oddly enough, the sport isn't listed under the 'Sports' headings. That being said, the top navigation bar is with you at all times on the app so you'll never be far away from jumping across. By clicking on the Horses button you will be greeted with the main menu. Now this menu isn’t all that flash and what are listed are simply the next half a dozen or so upcoming races. From here you will be able to see where the meeting is taking place, the race number for that upcoming race and then the minutes to post. The top of this page will include a 'more races' button which will take you through to a list of meetings. To be honest, we think it would have made more sense having this as the main menu then you can see straight away all the meetings that are taking place and be able to click upcoming races from there. One thing we did notice about the meetings that they covered was that the vast majority seemed to be based in the US. Whilst this isn’t a massive issue as we realise it is targeted towards the US market, if you compare them to the likes of Carbon Sports (find our full review of the Carbon US Racbook app HERE) who offer markets from meetings around the world, they fall quite a way short. One of the most impressive features that we liked from the app was the number of markets that you can bet on for each race. Once you have selected your meeting and then race, the next page allows you to pick from a cracking range of markets including Win/place/show, exacta, exacta box, trifecta, trifecta box, superfecta, superfecta box and daily double. We have found that the number of markets will range between each race, but generally there are at least 4 or 5, if not more to choose from. Depending on which market you pick will depend on the layout of your race card. The most common is going to be the win/place/show market so that’s what we are going to concentrate on, although there isn’t much difference between how this and the others work. 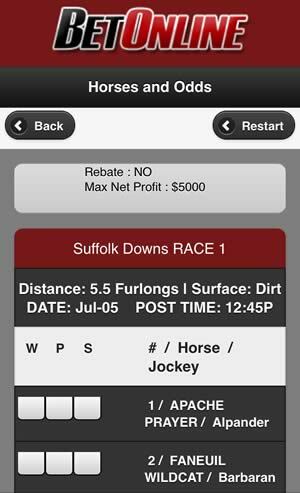 The race card will show you the distance of the race, surface, date, post time, horse, horse number and jockey. The left hand side is where you select the bet type and then enter the amount at the bottom of the page. One thing we noticed is that you can't actually see the odds of the horse racing, which is very odd. In fact, you need to enter your stake amount and click bet before you get to see potential returns from that bet and even then you don’t see the actual odds. We can't help but feel that the race card is a little thin on the ground and compared with its competitors, runs a little short. The design of the app isn’t particularly great and if we were kind we would say it's basic at best. There's just not that much going on in terms of design and very little to really get your teeth stuck into. Whilst the minimalist look does help in terms of lack of clutter, the lack of even the jockey's silks on the race card just felt really poor. The app functions reasonably well, but load times weren’t all that great even on a solid Wi-Fi connection. Even though we haven’t tested it out on anything less than Wi-Fi, we would hazard a guess that the app would struggle to load. 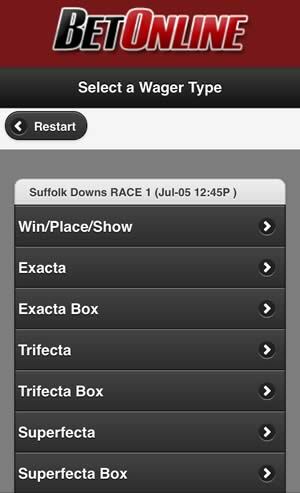 We can't help but feel that the BetOnline horse racing app is way short of where it needs to be. The basics are done reasonably well, but for a company that has been about as long as BetOnline and has the resources that they have behind them, it falls a little short for us. We liked the depth of meetings from within the US, but the fact that no other countries were included for other markets definitely left us wanting more. When you're going head to head with a company like Carbon Sports Racing you need to be able to at least match market depth, which BetOnline don’t! Whilst the app isn’t the best in the business, it's relatively solid without ever blowing you away.